MAN finally shows off an EV bus, but needs two more years to deliver it. As promised, MAN Truck & Bus unveiled at the 2018 IAA its first all-electric bus, the MAN Lion’s City 12E. 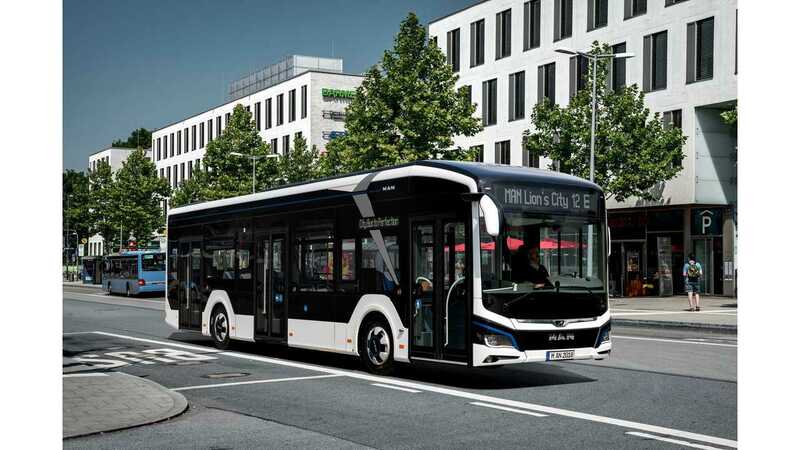 The German manufacturer (part of Volkswagen Group) is late to the party with electric buses, especially since series production is scheduled for the second half of 2020, which means two more years of maybe some pilot programs until volume sales will begin. According to MAN, the company "is operating on the assumption that around 66% of scheduled-service buses will be electric by 2030". Anyways, the electric version of Lion’s City looks good and seems promising. MAN opts for centrally mounted electric motors to lower maintenance costs compared to motors in close proximity to the wheels. The battery packs are installed on the roof - 480 kWh in 12-meter version and 640 kWh in 18 -meter version for at least 200 km (125 miles) of range in real-world conditions. "A slightly modified design highlights the unique nature of the electric drive. Its most striking feature is the lack of a rear engine compartment, with the batteries installed on the roof, making room for an ideal seating area at the back. Firstly, this positioning moves the batteries away from the vehicle’s rear, which is vulnerable in the event of a crash. Secondly, it allows for more design flexibility, more pleasant lighting and up to four additional seats in the interior." DC charging for now is limited at 150 kW, but it probably will be higher when sales begin in 2020. 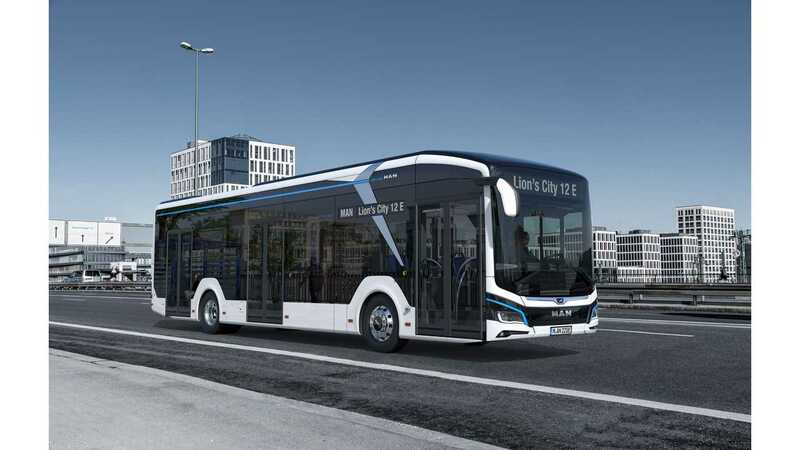 MAN Truck & Bus is showcasing its fully electric Lion’s City at this year’s International Motor Show (IAA) for Commercial Vehicles in Hanover, Germany. In light of demands for progressively lower emissions in urban centres, one thing is certain: the future of local public transport will overwhelmingly be fully electric. MAN Truck & Bus is operating on the assumption that around 66% of scheduled-service buses will be electric by 2030. In this spirit, MAN is showcasing the fully electric version of the new MAN Lion’s City urban transit bus at the 2018 IAA for Commercial Vehicles. This tops off MAN’s new generation of city buses, following on from diesel and gas engines with a zero-emissions variant. A slightly modified design highlights the unique nature of the electric drive. Its most striking feature is the lack of a rear engine compartment, with the batteries installed on the roof, making room for an ideal seating area at the back. Firstly, this positioning moves the batteries away from the vehicle’s rear, which is vulnerable in the event of a crash. Secondly, it allows for more design flexibility, more pleasant lighting and up to four additional seats in the interior. MAN has opted for one central motor to power its electric bus (on the rear axle), then two to power its articulated bus (on the second and third axles). These are easier to access and more simply designed than motors in close proximity to the wheels, which provides advantages in terms of maintenance and the total cost of ownership (TCO). In particular, the articulated bus benefits in terms of its handling. The two driven axles increase its driving stability and, in turn, its safety, as well as providing maximum energy recovery when braking. The fully electric driveline produces 160 to 270 kW in the Solobus. The power used for this comes from the modular batteries with 480 kWh capacity (Solo) or 640 kWh (articulated). In selecting these, MAN decided to take advantage of precision-engineered battery cell technology from the company’s existing range. These batteries’ sophisticated temperature management guarantees especially strong availability, regardless of the time of year. This way, the Lion’s City E can reliably ensure their range of 200 km (or up to 270 km under favourable conditions) over their batteries’ full life cycles. The batteries are plugged into a CCS and charged at the depot, which can fully charge Solobuses in under three hours and articulated buses in under four with an average charging power of 100 kW. This length of time falls accordingly when the maximum charging power of 150 kW is supplied. MAN surveyed close to 200 customers throughout Europe and received feedback from several cities. It concluded that, for the sake of routine operations later in the day, flexible and uninterrupted service (without opportunity charging) is more important than an unlimited range. Especially since battery technology is developing at a rapid pace. 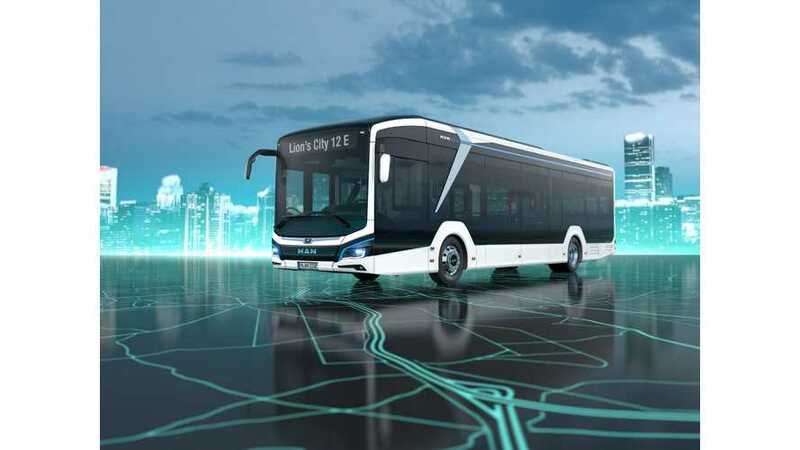 The Lion’s City E will remain at the cutting edge in this regard, as it will be possible to upgrade the vehicle concept to the next battery generation. Charging outside of peak hours will also enable operators to tap into smart charge management and benefit from lower electricity rates, further adding to the cost effectiveness of running electric bus services. Since the electric model is a fully-fledged member of the new MAN Lion’s City family, it will be easy to adopt into professional processes. And, as ever, transport companies will be able to benefit from the MAN service network. As part of MAN’s plan for electric vehicles (known as the eMobility Roadmap), a demo fleet will be tested to establish its suitability for everyday use in a series of field trials in mid-2020, partnering with various European operators. To this end, MAN has entered into several innovation partnerships with mass transit operators from Hamburg (Hamburger Hochbahn and Verkehrsbetriebe Hamburg-Holstein), Munich (Stadtwerke München and Münchner Verkehrs Gesellschaft) and Wolfsburg (Stadtwerke Wolfsburg and Wolfsburger Verkehrs-GmbH). Another partnership MAN has agreed is with two companies from Luxembourg: Voyages Emile Weber and Losch Luxembourg, a Volkswagen Group importer and the largest dealership group in the country. The MAN Lion’s City E vehicles will then go into mass production in 2020. MAN Truck & Bus recognises that transport companies and fleet operators face a number of challenges beyond straightforward vehicle considerations when transitioning from “low emissions” to “no emissions”. As a result, it has established a specialised consultation team called MAN Transport Solutions for custom transport solutions that deliver maximum cost effectiveness. Drawing on a wealth of experience, the highly-skilled consultants are not limited to providing advice regarding the vehicle itself. They can also cover issues relating to infrastructure and energy demand, as well as maintenance concepts and fleet design, providing the best possible support to the operators.